T his video was taken by Susanne DiVincenzo – bass and cellist in Alive! – at sound check on August 2, 2015 for our performance that night at the Freight and Salvage Coffeehouse in Berkeley, CA. Carolyn Brandy on congas, Michaelle Goerlitz on repinique and cuica, and Elizabeth Sayre playing sordo, the big bass drum. You’ll see me after about 30 seconds playing drumkit. 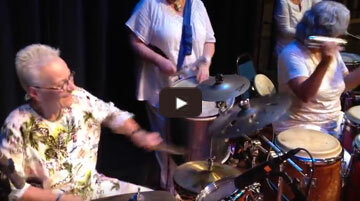 This rhythm we are playing is samba from Brazil (from the song, Skindolele (Always Alive! CD). The “batterias” or drumlines that play this music in Brazil can be well over 100 people strong. There are many other instruments played along with the various drums: agogo bell, tamborim, pandiero, caixa to name a few. You can take a look at some of the Samba instruments here: http://www.steveweissmusic.com/category/brazilian-percussion. This entry was posted in Performance on June 2, 2016 by planetlink.